Everything starts with an airport. Occasionally a train station, and rarely a harbour terminal, but mostly an airport. The displacement, fleeting encounters, accelerated adaptation in each new environment all stand in ironic contrast to the jet-setting lifestyle in the advertised job description. Works in the programme reflect on the artists’ journeys – both literal, on tour between airports, venues and hotels, as well as personal, longing for things far away. Just 3 days. A flash. Just gone but deep inside me. I ask why it happened and why these memories are there. Why the world is so large yet the memories that are important are nonetheless few and so intense that you can smell, feel and taste them. And our lives continue in our time in two different worlds. Almost as if nothing happened. I see the synagogue, I see the dirty streets, I see your flat, I can still taste the cold meat and the watery soup your mother made. All the essential things in life fell into place. Mavin Khoo, born in Malaysia, trained in India, Britain and USA. An established dancer and choreographer, he has worked with Wayne McGregor and Akram Khan, and has danced with Sankalpam, Random and Shobana Jeyasingh dance companies. As a Bharata Natyam soloist, Khoo has toured internationally. He also runs his own dance company, which has created work for the Venice Biennale and Canada Dance Fesival. Yamuna Devi trained at the Northern School of Contemporary Dance and London School of Contemporary Dance, specialising in South Asian studies. She has worked with Imlata, Tavazia and currently with Shobana Jeyasingh Dance Company, touring internationally. She has choreographed and performed her own work at The Place and South Bank Centre. She also regularly teaches Indian dance and Acro-yoga. Stuart Thomas is a dancer, teacher and choreographer.He began his career with Union Dance Company and has since danced in the UK and in New York. A specialist in Graham-based modern dance and Tai Chi, he now travels often between London and Southern China. The Sisters is a fairytale with an ambiguous ending, or no ending. 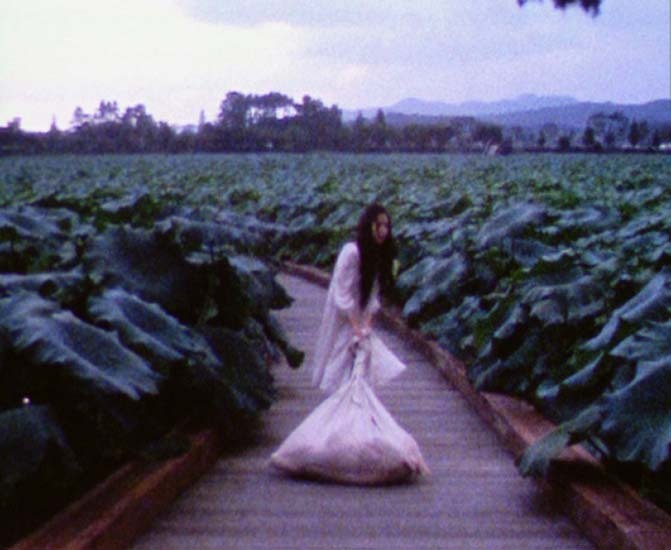 A young woman drags a bag across a field of lotus leaves. When she throws the contents into a pond, we discover that the bag contained the body of her twin sister, or possibly her own. The girl pauses to look at her own image. The young woman’s actions are set in a serene setting, but they reveal a struggle - an attempt to free herself from her own image. The attempt inevitably fails, and she repeats the journey, travelling with herself, again. Born in South Korea, Jihye Park is currently finshing her MA degree in Goldsmiths. Her video works explore the fairlytale aesthetics, proceeding slowly and colourfully. Janet McEwan’s cards are mementos for the future. The keepsakes are simple, prosaic objects, like shells collected from a beach, marked with a few lines of poetry. But the artist does not keep them - she sends them away, risking them being lost in the postal service. This process mirrors the function of our memory - sending the incomprehensible away for processing at a later stage, and using the simplest of shapes as index entries for a larger whole. “I posted these ‘cards’ to myself while travelling on my own in the North East of Scotland where I had lived for 15 years before moving south. I felt dislocated in many arenas of my life and sending the objects/cards to myself was a reassuring ritual: a way of trying to make sense of the place I had found myself in. McEwan’s work uses the landscape and heritage of her environment as source material, often using stone and found materials. She currently lives and works in Cornwall; the cards represent a bridge between her past and present locations, abstracting the physical and temporal distance. Romain Forquy’s animation created from mobile phone camera snapshots reads like a personal diary, journeying through fragments of a relationship. Memories come and go in the form of grainy images, and are just as quickly consumed. The individual images themselves lose relevance, and flash through the screen at indecipherable speed, only occasionally stopping to allow a closer inspection. We notice a day out in the park, a trip to the mountains, a train, and, repeatedly, a woman. Strangely, we are left with a feeling that this narrative is not going to end well. Forquy, born in France, studied photography at the University of Westminster and currently works in London. His practice uses still photography, stop-motion animation and video to examine the relationship between events and the medium used to relate them. Pack is, literally, an artist’s packing list. Among the generic everyday items - socks, shirts - only one item betrays the occupation of the traveller: a book by Bob and Roberta Smith. Daniel Lehan’s recent works often use text to communicate commands or matter-of-fact political statements. This list is almost a set of instructions for an itinerant artist, a travelling salesman, and offers no promise of glamour, success or fame. Born in Sri Lanka, Makuloluwe has been working internationally as a choreographer and director since 2000. His last work was for the Geneva Ballet in 2008. Since then, he has been not only choreographing but interacting with the fine arts world in order to open up to new horizons as a curator and producer. He teaches dance and lectures in Europe and in the US. He is currently creating a piece at Harvard University in September and produce three news works in 2010, Othello of Shakespeare (UK and France), a new dance work for electronic music for Norway and a multimedia ballet work for Jacobs Pillow Festival (US). We would like to thank the artists, Aram Bolanovski, Jack Brindley, Josh Love, Sophie Edmonds, Toin Adams and Lanka Makuloluwe. Text by Pierre d’Alancaisez and Isira Makuloluwe. Installation photographs by Romain Forquy.